Some opt for the big chop while others like myself transition until a desired length is reached. My fears of being looked at as a boy, the assumption that my sexual preference had changed, and rejection from a current crush were some of the underlying factors in why I waited so long. I began my transitioning period after my last relaxer in August of 2007. I didn't know if I would make it through this journey because I never succeeded previous times. 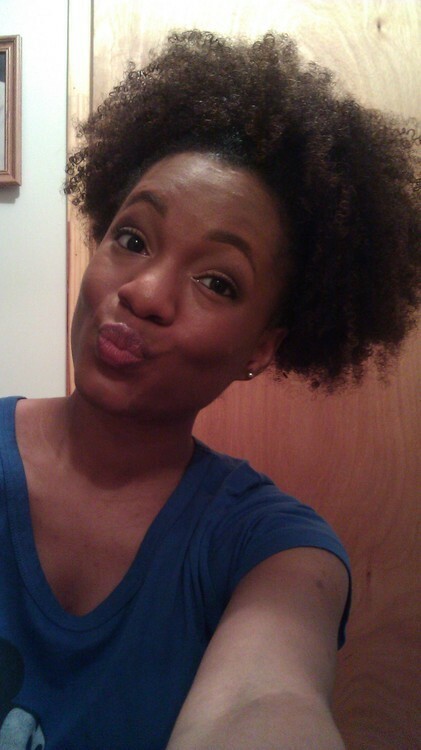 I kept my hair simple with buns, cornrows, and bantu knot outs. I stress to you the importance of leaving your hair alone during the transitioning process. The less manipulation, the less chance of breakage at the line of demarcation. On October 1, 2008 is when I became fully natural. My boyfriend at the time supported me during my transitioning period. He was there when I cut off the last inch of my relaxed ends. He made me feel completely comfortable with being who I was always meant to be, a beautiful woman who accepted all of me. I now had a head of hair that I wasn't quite sure how to style, but that's where research came into play. For years, I had searched over the internet for information such as on MotownGirl.com. I even resorted to buying books such as Going-Natural: How to Fall in Love with Nappy Hair and No Lye: The African American Woman's Guide To Natural Hair Care . The true test of my journey was dealing with the reactions of the general public. My first comment rather a compliment regarding my hair was from a Hispanic woman from work. It felt great to hear that my hair was viewed in a positive light especially from someone with hair that society viewed as "good". I was surprised more so by the number of Black men that viewed my hair as beautiful because seeing natural hair was scarce at the time. It was the best feeling in the world to be true to myself and for others to see the beauty in that. After all these years, I've learned more about my hair. Being natural has liberated me to say the least. I've embarked on a forever learning experience and welcome you to join me. Everyone's journey will be different, so let's teach each other. Any questions you have, just ask. Feel free to submit your photos to be reviewed for the blog.